We are delighted to announce that we will be working with Manchester Brewing Company to develop our very own pale ale called ‘Ten Boroughs’ in celebration of the wonderful community projects we support across the ten boroughs of Greater Manchester. ‘Ten Boroughs’ will be launched in Forever Manchester Week, taking place between 10th-17th June, and will be available to buy from participating venues as part of Manchester Beer Week. Our partnership with Manchester Brewing Company follows the recent announcement that Forever Manchester are the chosen charity for Manchester Beer Week. Ten Boroughs is a 4.5% straw-coloured pale ale, brewed in the grand tradition of the Manchester style – dry, bitter, eminently thirst-slaking! – brought bang up-to-date with a whole heap of the American hop “Azacca” to add aromas of mango and pine. The ale will be available in 9 gallon cask, 30lt keg, and 330ml can, and Twenty five pennies from every sale of this beautiful brew go to Forever Manchester. 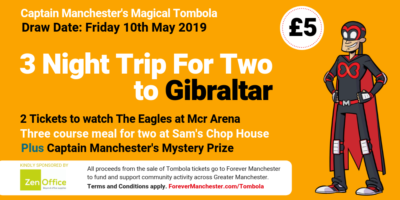 If you run a bar, pub or club in Greater Manchester and wish to stock ‘Ten Boroughs’ as part of our Forever Manchester Week celebrations, please contact us at FMWeek@forevermanchester.com or ring us on 0161 214 0940. If you fancy joining the good folk taking part in the ‘DeCaskthlon’ pub crawl around the Northern Quarter on Sunday 12th June, raising money for Forever Manchester, check out the DeCaskthlon event page here.